Manderson, WY With the trailer unhitched and the vise taken off of our clock and no where we had to be, it was time to see the neighborhood. Later in the afternoon, Chaco and I went ten miles the other way to Basin to take a look at the county fair. It was a family affair with trailers parked all around the stockyards. A couple was playing guitar and singing to a small audience, half-listening and half-talking, some seated with their backs towards the stage. The big attraction was several water games with lines waiting to play. The parking lot was pretty full. 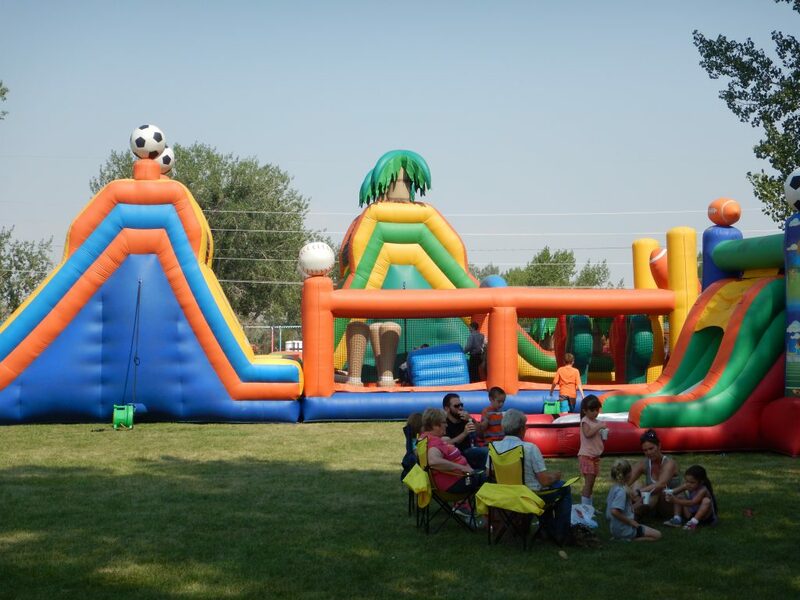 The event must be circled on the local calendars months ahead of time. We went by the local co-op to buy a fishing license, gloves, and duct tape, then thought the Cone Zone was a good idea on a hot day. The ice cream server was in her 3rd summer behind the counter, she said, and an incoming senior at the high school. We asked her after high school, then what do young people do around here? She said it depended on whether they had any ambition. She did, and was interested in going to college at Mesa, which she described as a state school in Grand Junction, Colorado with good dorms and a liberal arts program. 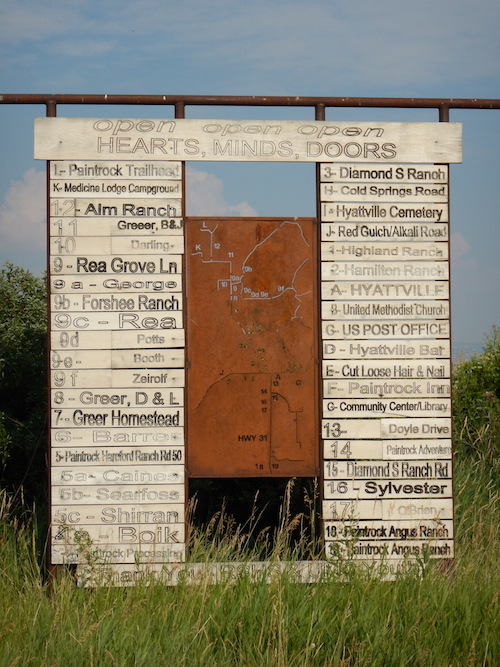 On the Manderson turnoff there was a sign saying Medicine Lodge Archaeological Site, 26-miles. What the heck, and away we went. After we passed the oil pumping jacks and dry hills, we drove through expansive fields and cattle herds, suddenly as we closed the gap, we saw a massive red sandstone mesa on our left side. Entering Wyoming’s Medicine Lodge State Park and Archaeological Site, we realized we were in for an unexpected treat. 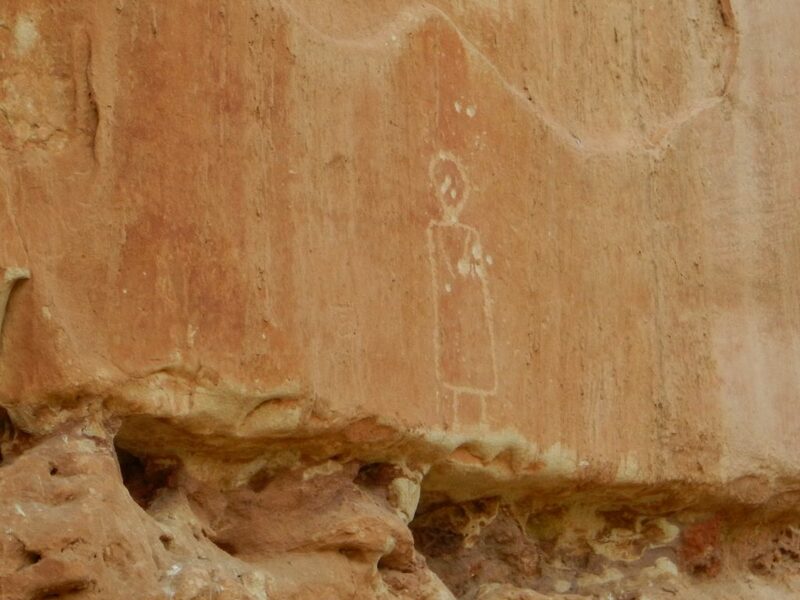 The cliff side was speckled with petroglyphs created thousands of years ago. Excavations had found arrowheads and tools indicating habitation along this cliff and creek for over 12,000 years. 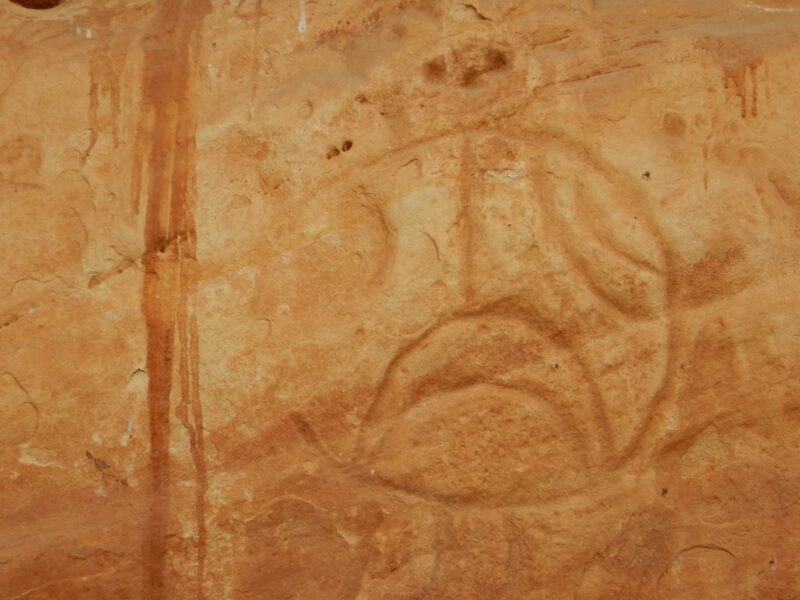 The drawing were designs and representations of people and animals. Amazing! There was also a natural history cabin and another for describing how they managed elk in the wildlife management area that went farther down the valley about 14,000 acres, a donation of the Taylor family who had ranched there since the 1880s. The camp and trailer sites were immaculate. 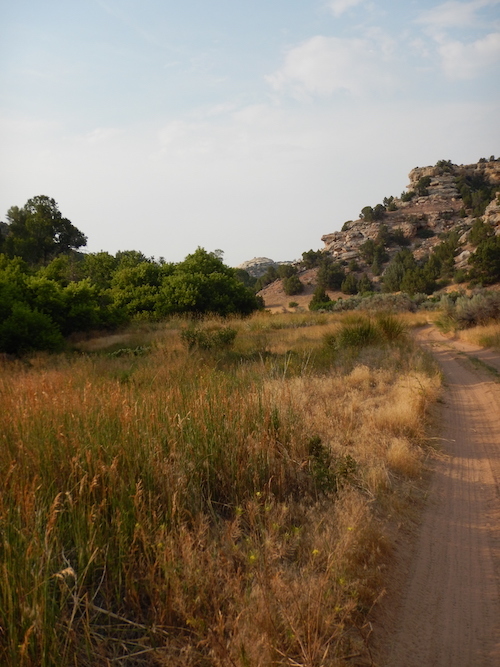 There was a walking trail along the campsites and the creek. 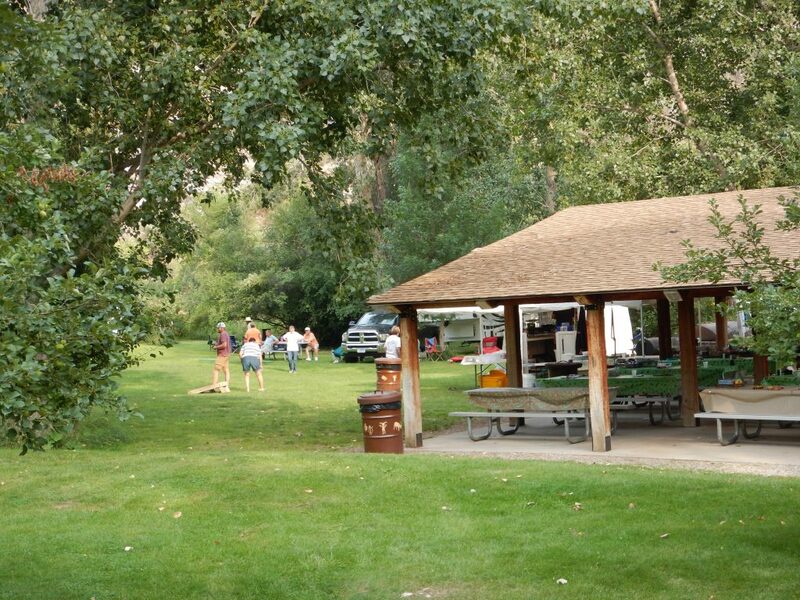 A group camping area must have had ten tables lined out behind their cooking areas for either a huge family reunion or a community encampment. There was a public corral, if you had brought your horses. Not having any, we journeyed into the management area on our 4-wheel drive for five or six miles until water holes argued for better judgment, though we were enthralled the whole time. 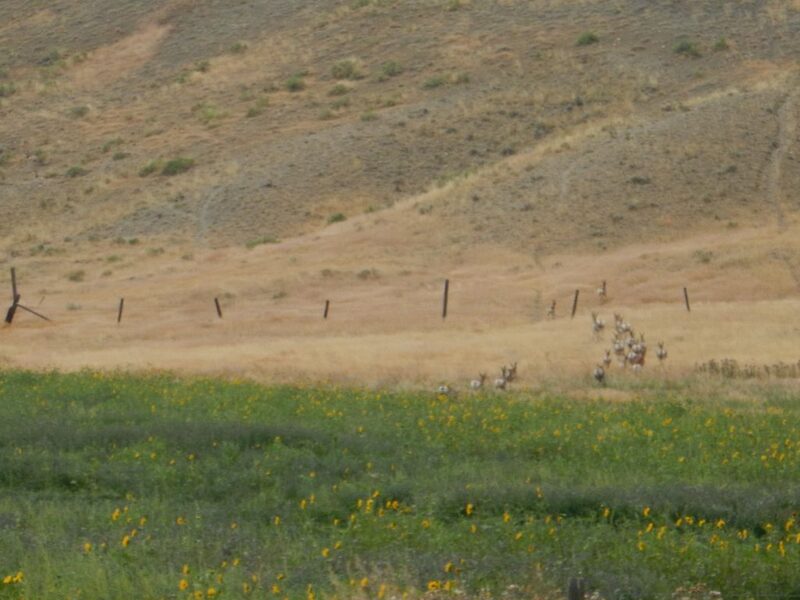 Coming back we first stopped when we saw a group of eight deer in a field on our right. 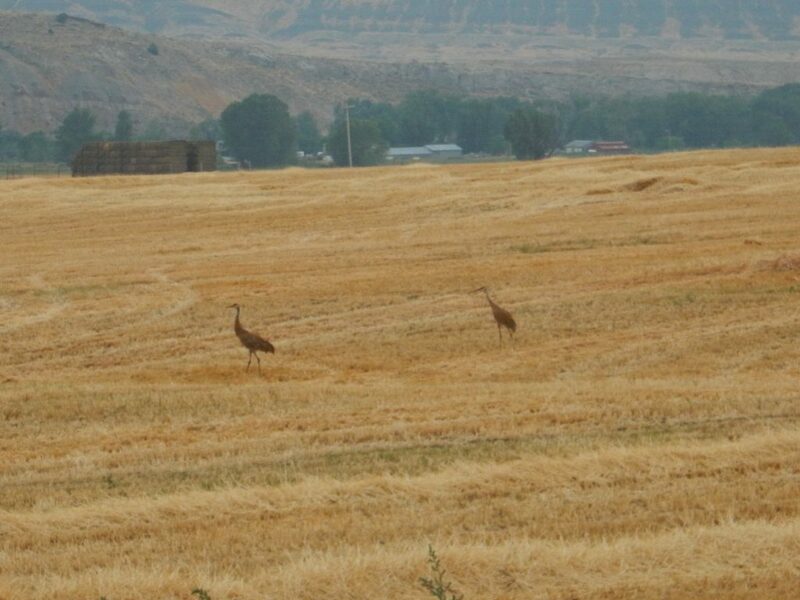 A couple of miles later we saw two sandhill cranes strutting elegantly through a recently mowed hay field. Another ten miles and we noticed movement in a field on the left and it was a herd of antelopes, who started running as we slowed for a picture. We were in a different community and culture, but we were comfortable here. We liked this neighborhood! Please enjoy Randy Newman’s Sonny Boy. This entry was posted in Ideas and Issues and tagged Wyoming by Wade. Bookmark the permalink.